Whether it be by the shores of Batroun, or on the sandy coasts of Sour, Lebanon has some of the best beaches you can hope for, so when the weather is beautiful and breezy take your workouts outdoors and enjoy the sound of the crashing waves. Fitness never felt so Breezy. Warm your body up by running a few laps up and down the coast on the sand. When you feel comfortable enough, mark a distance by drawing a line in the sand or by putting two towels by the ends. Sprint from one end to the other, try to do 15-30 second sprints, with a ten-second break between them. It’s much harder to sprint on the sand, so the resistance makes it so much harder than regular sprints so you'll feel them much more. If you want to graduate from the Sand Sprints, and simultaneously feel like you’re on Baywatch, Water Jogging or Running is for you! Not only does it keep you cool, but also the water adds extra resistance, making you work out harder. This is probably better for sandy beaches, like in the South of Lebanon. This is a great way of making cardio more fun in your regular fitness routine. 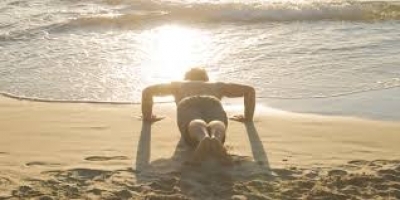 On cool, dry, and soft sand, lower into a plank position. Crawl forward on your hands and feet for half a minute, or a full minute if you can. The smooth sand destabilizes your hands and feet, making your hamstrings and glutes work harder. These are you basic lunges but with the added difficulty level of doing them on the sand, step one foot forward, while keeping your front knee above your ankle, go lower so that your back knee slightly touches the sand. Then come back up, and do it again. Do this times and then reverse legs. Enjoy the relaxing feeling of yoga while watching the beautiful sunset next to the shore. All you need is a towel and your positive energy. Whether you do your favorite flow by yourself, or take one of the many available sunset yoga classes offered in Lebanon, you are bound to enjoy this workout to the fullest. What are the advantages of a workout in the sand? When you work out in the sand, your body has to work much harder. This is because sand isn’t a stable surface–it’s always moving underneath you, and you continuously need to make tiny adjustments to maintain each move. This results in using more of the muscles in your feet, legs, arms and core, including muscles that you probably don’t normally use. So, this is something to definitely add to your normal fitness routine.